A personal record of my three month walk of the full length of Great Britain from north to south with written journal and photographs. Tracklogs for GPS units and for use with Google Earth are available for download for each stage. My first full day of walking in Devon was a treat. It was one of the most undulating days of walking on the entire Great British Walk and though height never exceeded 250 metres there was over 650 metres of climbing throughout the stage. 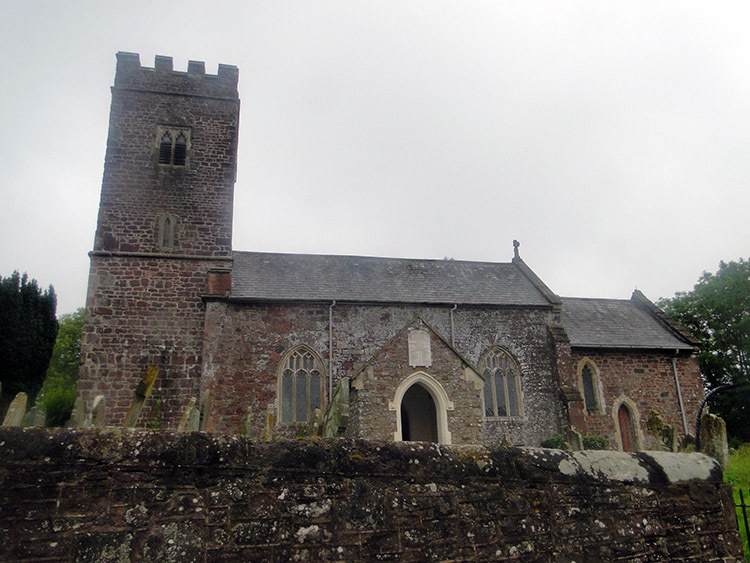 The walking was across pretty Devon countryside which was almost entirely countrified. There were no towns seen after leaving Tiverton and only a few tiny hamlets until we reached the end of the day in the village of Morchard Bishop. In fact it was the least inhabited stage of all those I had walking through England. August had arrived, the fourth month of my Great British Walk which had began in the far north of Scotland during May. And the first morning of August was a grim one. Rain was spattering the window of the bedroom when I woke and it continued to drop down from the clouds over Tiverton throughout breakfast. Steve and I did not delay though, off from our digs as soon as possible after breakfast. 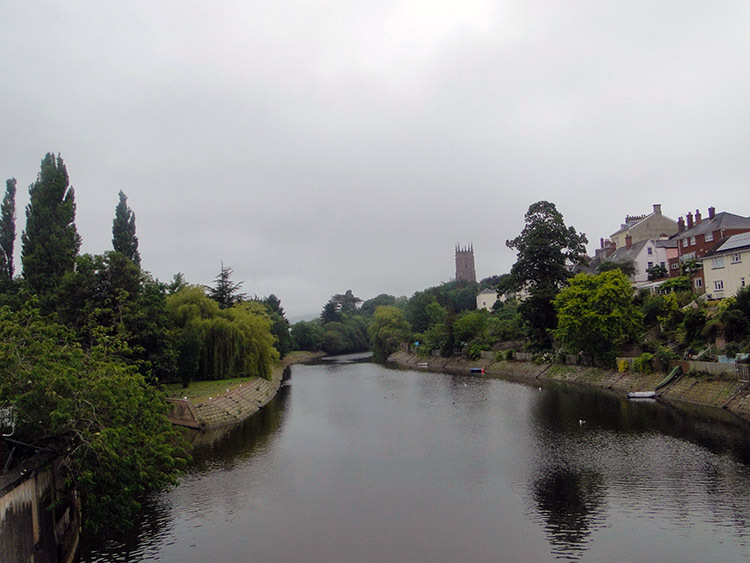 It was just 8.00 o'clock in the morning when we crossed Angel Hill Bridge and looked across to the River Exe running through the centre of town. Fortunately the rain had just stopped when we viewed the scene. We knew it would not be for long though, the BBC had warned us it would be showery for most of the day. There was a lot of road walking in the plan today but at least these roads would be very quiet. All we expected was farm traffic and the odd local going here and there. There were no towns or big villages for miles once we were out of Tiverton which we left by heading up Seven Cross Road. It was quite a climb up the hill and we made 160 metres of height in the first two miles of walking to the Seven Crosses at 223 metres altitude. Why it was called seven crosses we could not work out. It was a road crossroads though which marked the end of our first climb. We crossed straight over the crossroads and walked downhill to Worthy Bridge, losing 140 metres of the 160 gained. After Worthy Bridge we immediately climbed again, this time 100 metres of height to Kingdom's Corner. By the time we reached there we had accumulatively climbed 260 metres and walked four miles, all on tarmac road. We had not seen one car since Tiverton. At Kingdom's Corner we left the tarmac and followed an unmade bridleway through Black Down Copse. 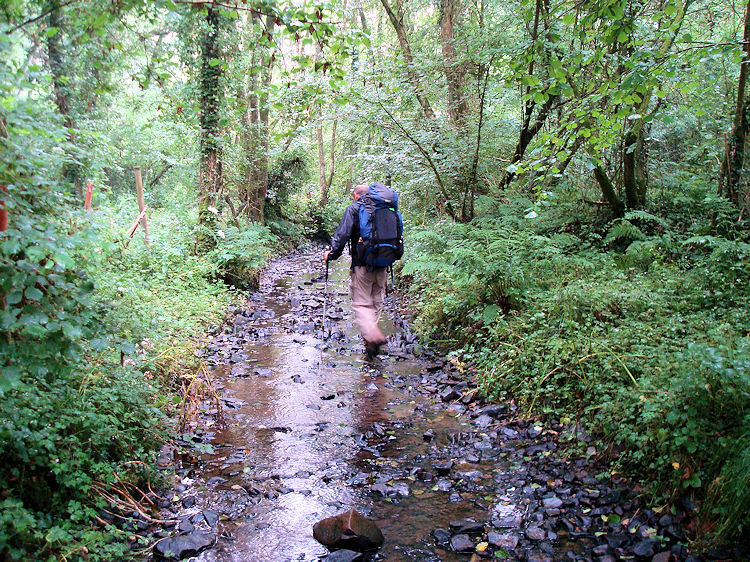 It was a sunken bridleway if not quite a holloway and any water that found its way onto the track ran down it to form mini streams until it tricked away into a side cutting. This was to be a familiar theme today, walking in temporary watercourses. The rain returned as we walked under tree cover through the copse. We could hear it spattering onto the canopy above. From Black Down Copse we crossed a couple of fields to Cotton Farm and Cotton Heath Farm before arriving at tarmac road once more. We followed it to Heath Cross and then to Swing Gate Junction. I noticed all the roadsigns around these lanes had names and each roadside sign also had a logo. Swing Gate had a ship drawn onto each face of a pyramid on top of the signpost. From Swing Gate we walked into Way Village which was little more than a Methodist Chapel and a few houses. We were in and out of Way Village within the same minute. The road we had followed through Way Village petered out soon afterwards at Lower Claw. 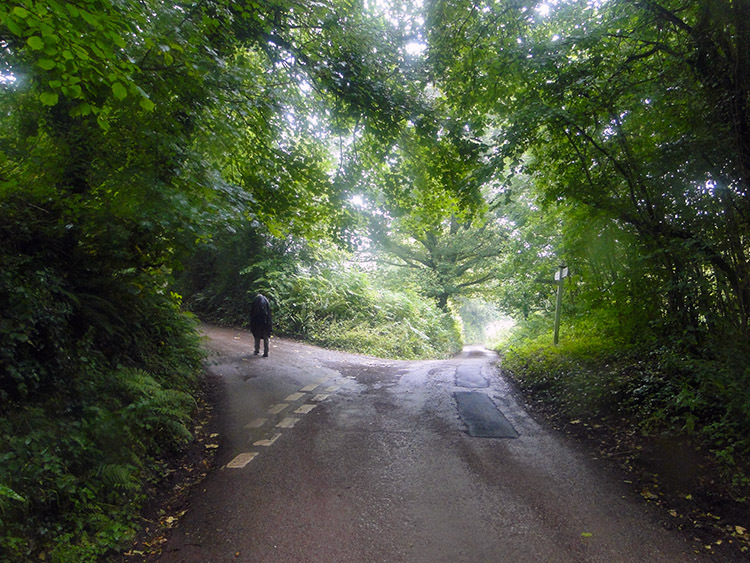 The road became another bridleway through a copse, this one called Mill Down Copse. 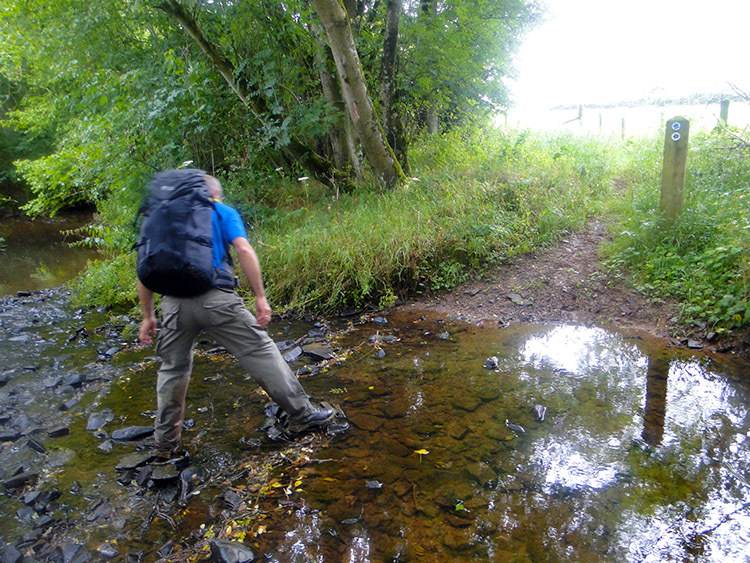 With the accompanying rain a temporary stream had formed which Steve and I had no option to wade through. This time while under tree cover though we noticed the rainfall was beginning to abate, the drum of raindrops on the canopy above easing as we made our way through the woodland. By the time we arrived at South Yeo Cross the rain had stopped and as we walked into Poughill which was the next village on our way we could at last see beyond our immediate surroundings and a little further into the distant countryside. While there was no chance of sunshine at least we might be able to enjoy views of Devon during the rest of today's walk. Poughill was a little larger than Way village, having 83 households recorded when we walked through. I did not see 83 houses, nor did I see anybody about. Poughill could have been deserted just as Way Village could have been earlier. Never mind seeing no moving cars since leaving Tiverton, we had seen no moving people either. 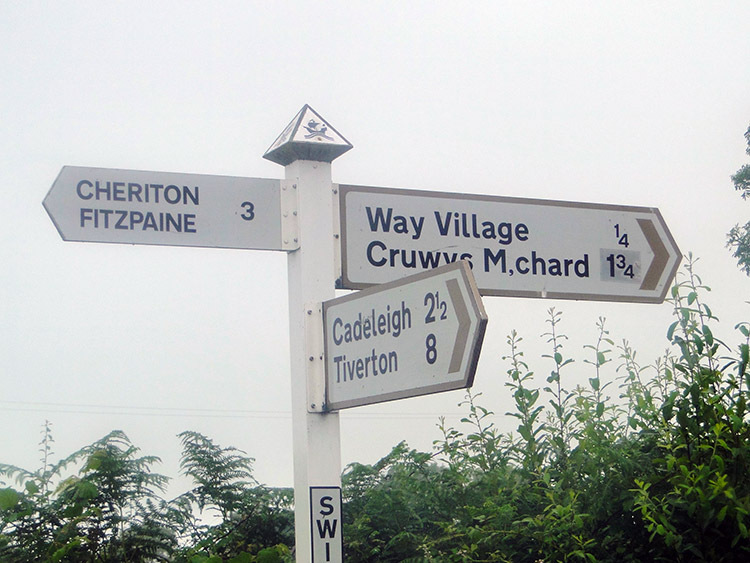 In fact my most interesting find in Poughill was another signpost. Again it featured a ship logo and this one pointed directions to Woolfardisworthy and Black Dog. It was a shame we were not heading their way, I would have loved to check the villages with such wonderful names out. 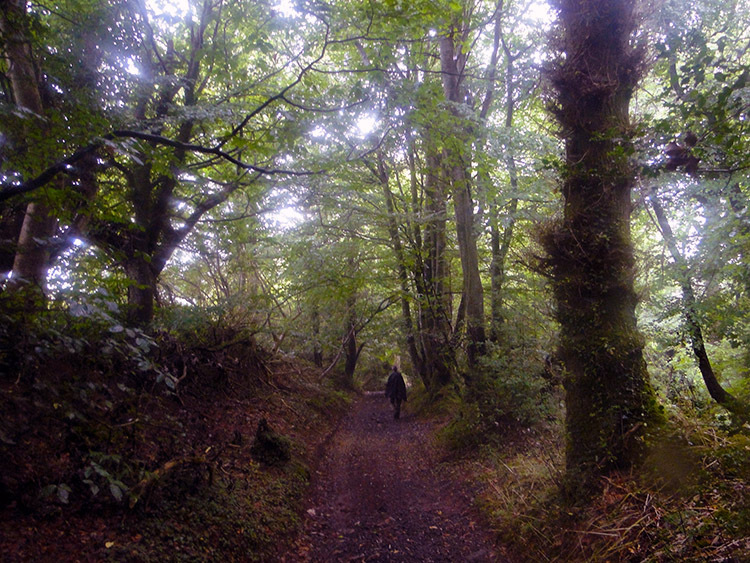 Instead when we left Poughill, and eerily just like when we had left Way Village we walked along a tarmac road to nowhere which petered out into an unmade bridleway. For Lower Claw substitute Welsbere Barton. At the end of the tarmac we passed a car which had met its end. It had been rolled over and pushed into the hedge back. The unmade bridleway led us downhill to cross Binneford Water. It was the only time in the day we dropped to below 100 metres when we bottomed out at 95 metres by crossing the watercourse. From Binneford Water we crossed fields towards the village of Kennerleigh. The last of those was strewn with farm machinery. There were old tractors falling to bits and there were a few old silage trailers too. There were flat based trailers and heavy rollers as well. It was a complete mess. At least the village was much pretty on the other side of the disgusting field of abandonment. We found people in Kennerleigh. Wow, that was such a nice change after the apparent emptiness of the villages we had walked through just earlier. And what nice people they were too. 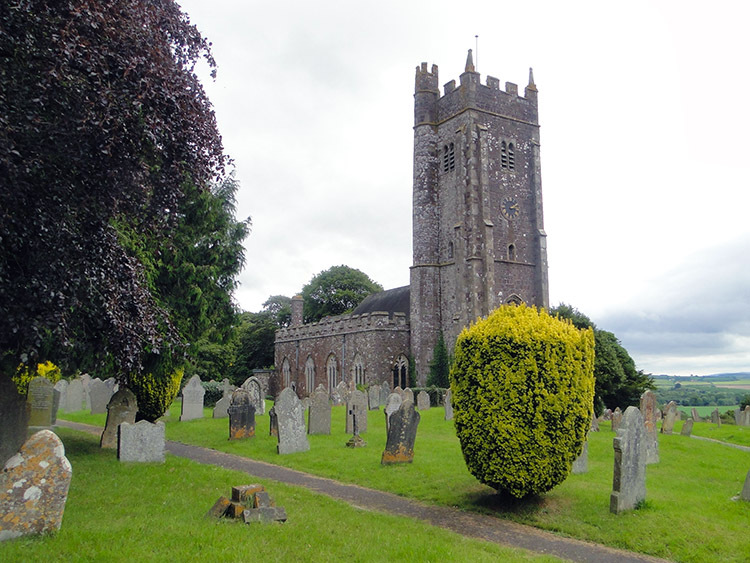 Our route through the village had taken us a little way along the main road and past the impressive village church before we turned right to follow Langham Lane from the village. 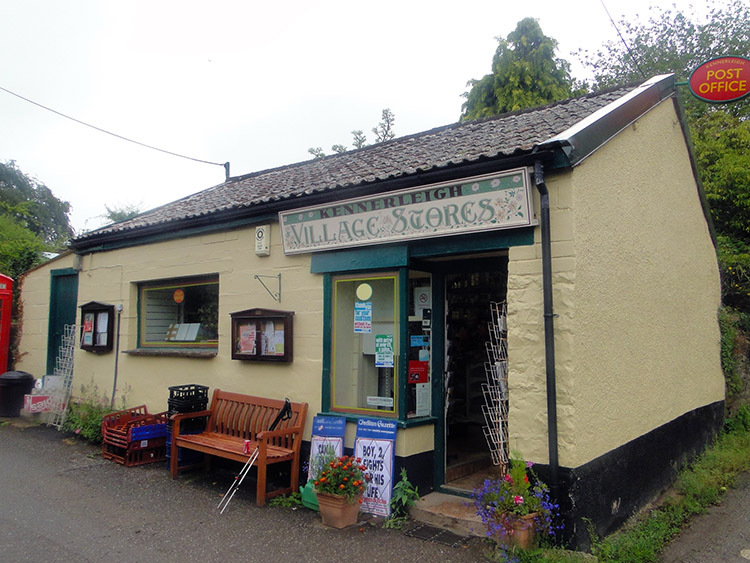 As we turned the corner from the main road to follow the lane we came across Kennerleigh village stores. We had not expected to find a shop but there it was. It was a little building, brick built and painted cream with a corrugated roof, more like a cricket pavilion than a shop. It was so quaint and I just had to enter. There was a lady behind the counter and a couple of ladies chatting with her. Whether they were shopping or not I cannot say but they beckoned me to be served first. I bought both Steve and I a Kit Kat and a soft drink. I also bought a newspaper to read when we had finished our walk because we always enjoyed doing the crossword afterwards and before we went out in the evening. It was either the Times or Telegraph, I cannot recall. Anyway, the ladies in the shop were very friendly, I do recall that. It was a very nice part of my day chatting with them in the shop. Steve waiting outside and was wondering what had happened to me. I was in there 10 minutes talking with the ladies though it seemed like just one minute at the time. I must have mentioned the walk. From Kennerleigh we walked west across fields at around the 120 metre altitude line. It was around 1.00pm in the afternoon and the rain was now well and truly stopped. The views had opened out too and continued to do so as the afternoon advanced. Looking right and across to the north I could clearly make out the upland bulk of Exmoor, 20 miles away. Field crossing turned to bridleway and then to road at South Emlett which would lead us all the way to our days end goal in Morchard Bishop. We soon reached a dog leg in the road near Emlett Hill and pulled in by a field for Steve to take a comfort break. He hopped over the gate to do so. A minute later he had not returned so I shouted "Where are you, what's up". He replied "Come here" and so I leapt over into the field too. He was sat down on the steps of a caravan talking to a chap. It turned out the chap was a wandering farm helper who was working for the summer season at nearby Emlett Farm. The deal was that while working at the farm he could stay in his caravan in the corner of this particular field. Keep the area clean and tidy was all the farmer asked in return. He turned out to be a nice chap, a loner who liked it that way. "I could live a life like that" said Steve after we had left the chap to return to his solitude. 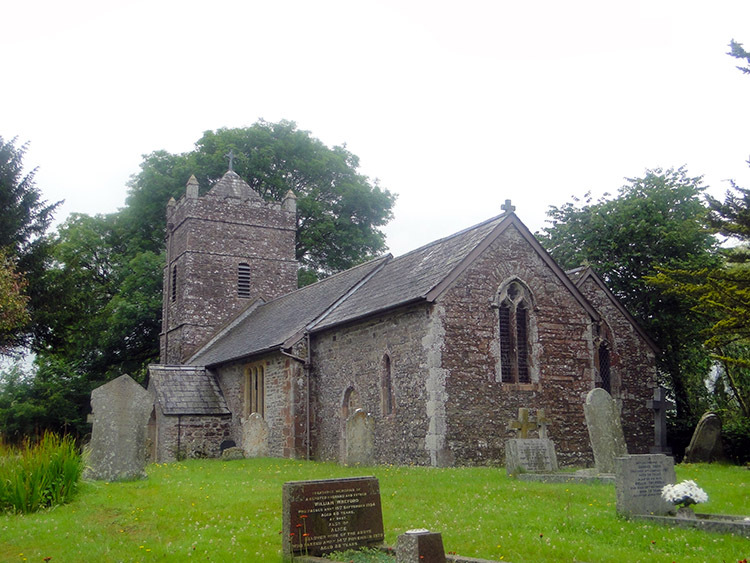 After our surprising meeting with the man living in the corner of a field we resumed our walk along the road and three miles of pretty boring road walking later we arrived in Morchard Bishop. There are lots of stories to tell about our stay in this village of strange people but more on that later. For now I will stick to the time line and focus on our arrival. As we walked into the village from the east we came to a car park where the Two Moors Way also enters the village. I spotted a couple of walkers in the car park, stood and looking studiously at a map. They saw me and approached. It was a man and a woman. "Can you tell us where we are" asked the man. He had a foreign accent of which I was familiar, either Dutch or German. He thought he was in a particular place and I confirmed he was. Oh thank you, I wanted to be sure. We are walking the Two Moors Way and checking the way from here" he said. The lady smiled and they both walked on into the village. I thought it strange when they walked past a sign pointing the route of the Two Moors Way, especially just after they had asked me to confirm it. They walked into the village instead and disappeared from view. I thought no more of it. We stopped by the car park for 15 minutes rest before walking into Morchard Bishop to find our accommodation. 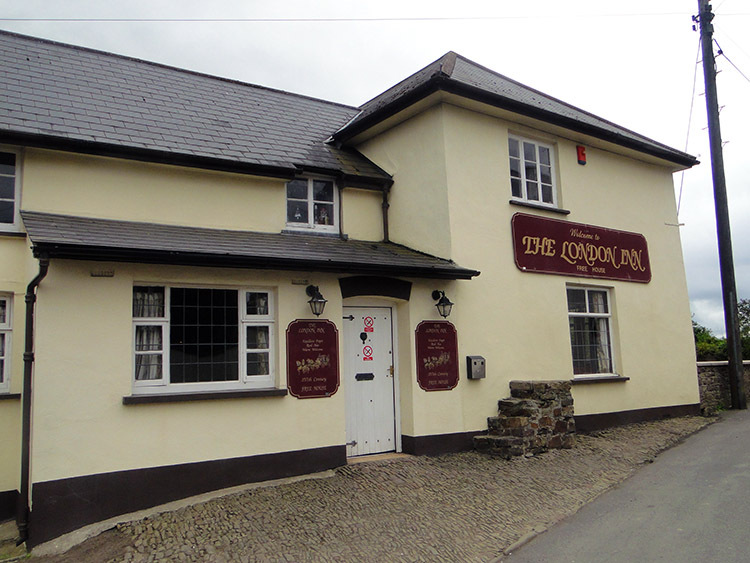 As we walked through the small Devon village set on a hill at around 170 metres we noticed the London Inn on a corner. "Good, that is us sorted with a drink and bite to eat tonight" I said. It looked empty in the pub as we passed but it was not. People were watching us. 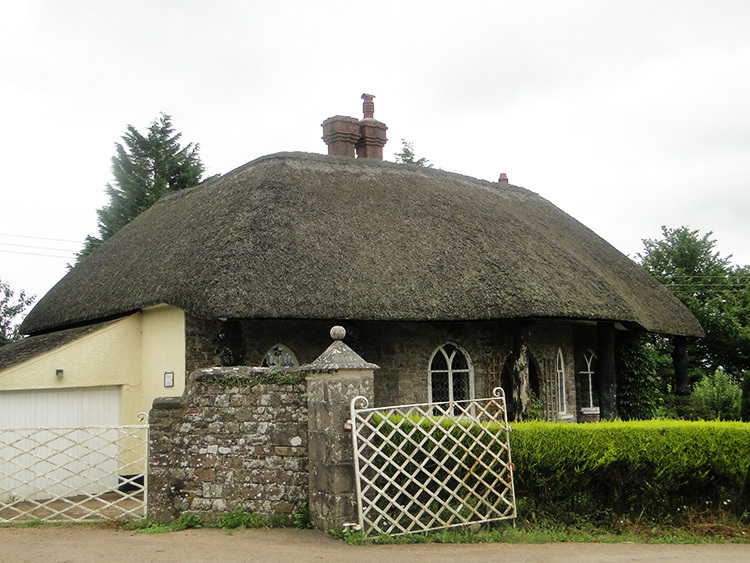 We walked from Morchard Bishop southwards down Polson Hill to find our accommodation at Shippons. Doris Snell was waiting for us, a diminutive lady in her mid eighties. She ushered us into the conservatory at the rear of the house. She said "Off with your boots, now how do you like your tea". Steve tried to say he was OK, wanting to retire to the room for an afternoon kip as it was just 2.30pm. Doris was having none of it. "You will do as you're told, tea and cake first" said Doris and that is what we got. We chatted with her during our afternoon tea and she asked us what we would like for dinner in the pub tonight. "We have not thought about that yet" said Steve. Doris replied "Well the pub need to know. They have seen you two walk into the village and knowing you were staying with me they would like to prepare in advance. That is the way it is here". She showed us the pub menu. So we chose our food and after refreshments we retired for an afternoon of kip, rest, crossword and Deal or No Deal. Steve was hooked on Deal or No Deal, if we got to our accommodation in time during the walk I had no option but to watch it with him. In the evening we went to the pub and indeed our meals were being prepared for us. 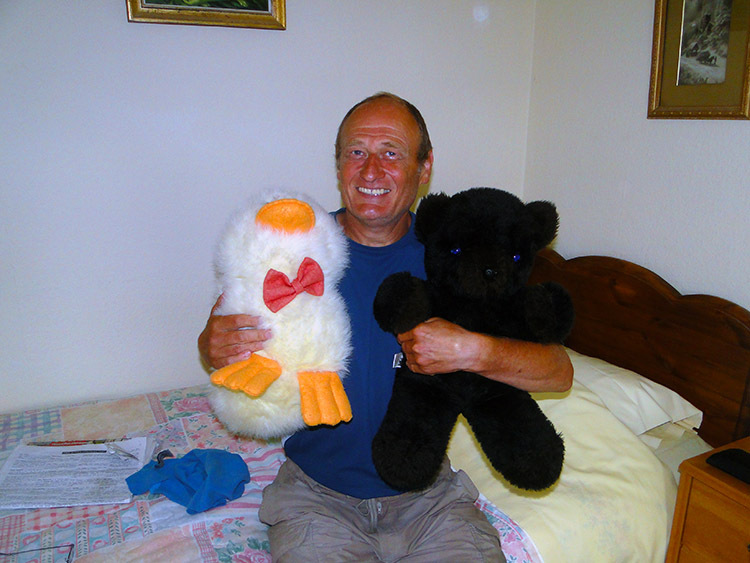 We chatted with Bob Davies at the bar who had moved to the village from the Midlands. 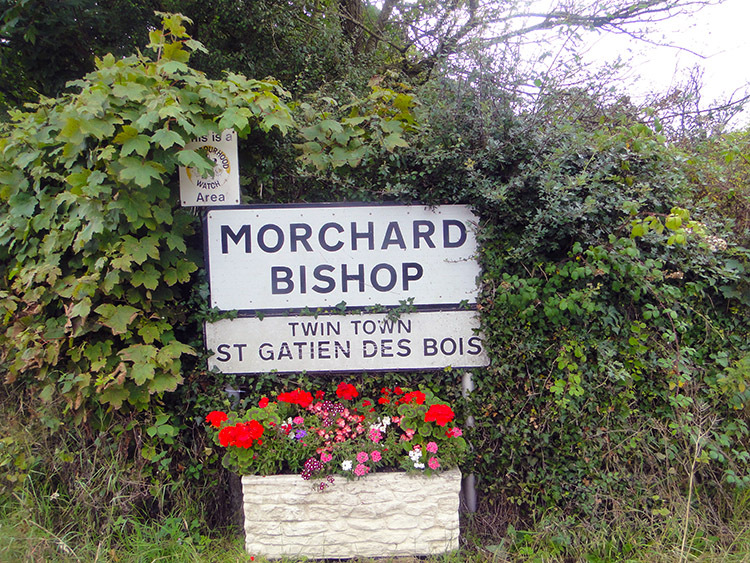 He told us about Doris who had been a widow for many years while running the Bed and Breakfast and he told us about three eccentric brothers that we should call in on our way out of Morchard Bishop tomorrow. It is a great story, I will save it for the next stage. Chatting on I said "It was funny walking into Morchard Bishop. We met a couple who appeared lost". Steve encouraged me to tell more and wound me up to try and tell the tale in the foreign accent I had heard. So I did and everyone around started to laugh. I could not imagine why it was seen as so funny. "Look behind you" said Steve while trying to contain his hysterical laughs. Then I saw the foreign couple sat at a table smiling and laughing". They were in on the joke too. We had a great night in the London Inn public house. Our excellent evening meal of Steak and Ale pie was cooked by Sarah Gillbard and the delightful barkeeping was conducted by the sprightly eighty six year old Vera Gillbard. Everyone was friendly and time passed so quickly. We giggled our way down the road to Doris's and sneaked in as quietly as we could. What a great day despite the weather. Goodnight.